for students in 3rd to 6th grade. Objective: Explain how the three major types of rocks are formed. 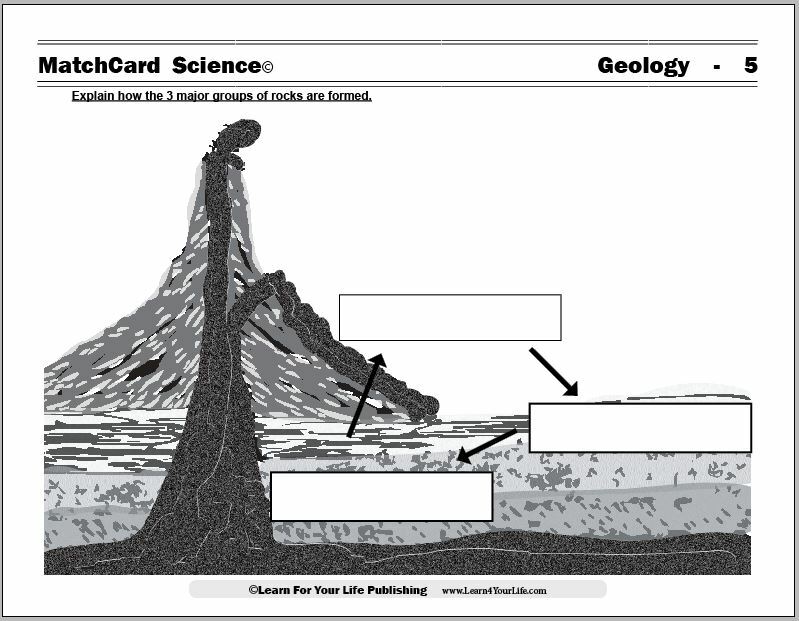 MatchCard Information Pieces define and describe igneous, sedimentary, and metamorphic rocks, which can be used as a rock cycle worksheet. Ideas for projects are listed on the instructor's page and below. 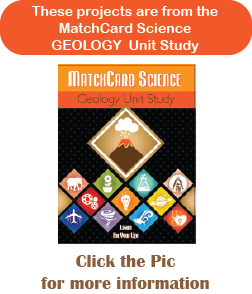 This is MatchCard #4 of the Geology Unit Study. 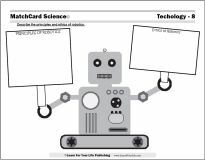 Look below for more information on MatchCards and the MatchCard Science curriculum. Igneous rocks are formed from the lava or magma of volcanos. When the volcanic material cools, it hardens into rock. Igneous rocks are the starting point of all rocks, and are the most numerous on the Earth. How can I tell if this rock is igneous? Igenous rocks are usually porous, or have small pockets of air. Bread and styrofoam are also porous. Tear off a small piece of bread or styrofoam and notice the pores. Igneous Rocks have smaller pores. Other rocks may be porous as well, but the pore of igneous rocks usually are about the same size and distance apart. Identify igneous rocks on the rock cycle worksheet. The igneous rocks are identified by the line at the top, indicating they are formed from volcanic lava. Memory Device: Igenous rocks were ignited by volcanoes. The weathering process causes the formation of sedimentary rocks. As other rocks are broken into small pieces they are carried away by water. Sedimentation is the layering of different rocks and substances in water, such as a creek or river bed. Different particles of different rocks and other substances become compressed. These other substances may be shells or fossils. The weight of the Earth's surface compresses these layered particles into sedimentary rock. How can I tell if this rock is sedimentary? If you have a large enough chunk of rock, one might see the different colored substances that made up the rock. Look at the sedimentation process. You may want to do the Rain Erosion project from the Weathering MatchCard to investigate how sedimentation occurs. It is also interesting to take a field trip to large rock formations. Often you can see the layering of these rocks, even from a distance. Identify sedimentary rocks on the rock cycle worksheet. Identify sedimentary rocks as those closer to the top of the earth's surface, indicating that the weathering process causes their formation. Metamorphic rocks are formed when other rocks are partially melted and remolded. This occurs deep under the Earth's surface where the temperature has increased. Metamorphosis means change. We are often familiar with the metamorphosis of a caterpillar into a butterfly. Metamorphosis is the change of one type of rock to another through the process of heat and pressure as the rock is melted and re-molded. Some forms of metamorphic rock, such as marble, show the mixing and molding of more than one substance. Some metamorphic rocks are foliated, or banded, which shows the direction of the pressure applied during the rocks' formation. Identify metamorphic rocks on the rock cycle worksheet. The metamorphic rocks are identified as the line underground, which indicates they are formed below the Earth's surface. As geologic processes occur, these metamorphic rocks can become magma; and the cycle restarts. Memory Device: Melting and Molding Morphs Metamorphic Rocks. 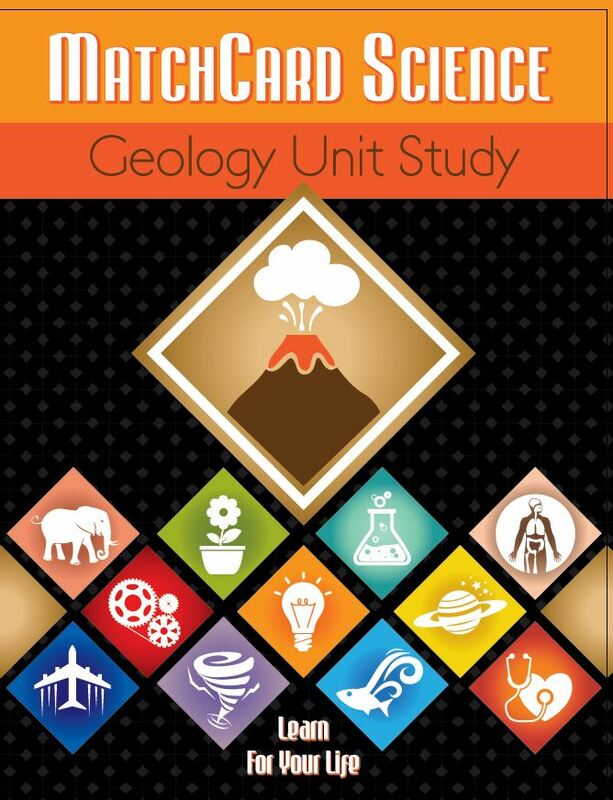 During your geology unit study, the student should collect specimens of rocks from your area. Let them try to identify which are igneous, sedimentary, or metamorphic. After trying to identify them, let them look in a rock field guide or on-line pictures of common rocks. Is it hard to tell? Don't get discouraged. Remember, we are often looking at small fragments of rocks, which makes it much harder to identify it. Compare that to trying to identify a tree if you had only one small piece of the bark. An expert could do it, but it might be a challenge for a novice. Try this project to emulate the rock cycle. Adult supervision is required for this activity. Use the cheese grater to shred fine pieces of one colored crayon. With the knife (or vegetable peeler) shave pieces off a second color. Shave similar pieces from a third colored crayon, but this time cut them even smaller with the scissors. Use a small hammer or other object (even a rock) to break the fourth crayon into small chunks. Put cold water in a re-sealable plastic bag. Add the four different "igneous rocks" you made. Agitate and shake the bag to mix the particles. Them leave the bag alone as they settle down and layer. Puncture a small hole in the bag to let it drain of all water. Put the first bag in a second bag to prevent the crayons from seeping out. Now put the bags in the microwave for about 5 to 10 seconds. This just softens the crayons. Check out your sedimentary rock. How does it differ from a real sedimentary rock? Now we are going to change our sedimentary rock into a metamorphic rock. Take the "rock" you made with crayons from the last activity. If you have a long, thin, "sedimentary rock," break it into two or three pieces. Put the pieces together in a stack. Then put it into the plastic bag that did not have a hole in it. Melt in the microwave for about 20 seconds. You can also place on the heating pad or in the hot sun for about five minutes. Now place the melted wax under a stack of heavy books. What do you think of your metamorphic rock? To demonstrate that the rock cycle IS a cycle, have the students grate the metamorphic rock to start all over again. Here’s a yummy way to review the rock cycle: metamorphic fudge! Let’s morph it all together. Fold the solid ingredients into the hot mixture. Can heat some more if needed. Pour onto waxed paper and continue folding the mixture onto itself. Let your rocks cool before eating them. Our nine objectives will turn your rock hunting student into a genuine junior geologist. Core content and hands-on projects in the Geology Unit Study will keep them watching the ground under the feet.